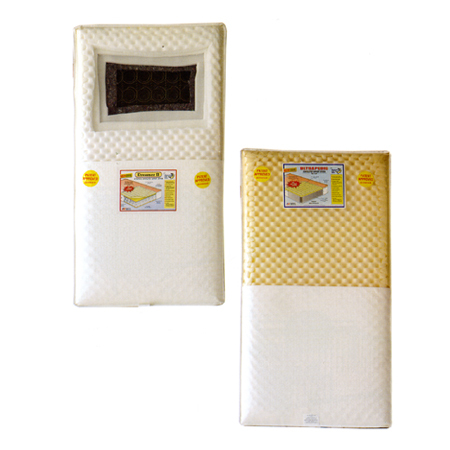 Baby Mattresses Furniture Store with a wide range of Home Furnishing Products. We feature ready to assemble and custom made items. Patented Convoluted Mattress features 5 In. extra-firm. 1 1/2 In. convoluted soft foam. A 2-in-1 mattress. Triple reinforced Antibacteral cover. Brass eyelet vents. Baby Temperpedic Mattress Features a visco foam consists of 4 In. Extra firm foam and 2 In. Visco elastic memory foam. It also has fully ventilated eyelet borders and a waterproof cover. Triple laminated antibacterial cover. Pantented Convoluted Mattress features 150 coil, 13.5 gauge steel coils. 6.0 gauge border rod for extra edge support. Highest quality coil fiber. Insulator pad, two cushioning layers of foam. Triple laminated reinforced ANTIBACTERIAL COVER. Square corners for better crib fit. 1 side convoluted for air mattress feeling. Brass vents.